When Eduard “Landslide” Folayang made his second defense of the ONE Lightweight World Championship in November of last year, it took place at the packed indoor sporting arena in Manila, Philippines. Folayang suffered an excruciating defeat at the hands of ONE Featherweight World Champion Martin Nguyen, who uncorked his signature overhand right at the Filipino superstar after he attempted to deliver a spinning back-kick. The punch connected right on the Team Lakay veteran’s chin, ultimately knocking him out in the second round and costing him his world title. In the aftermath of his unsuccessful second title defense against Nguyen, Folayang admitted that he did not exactly know what to say or how to address the loss. “It was hard to talk about it for a time. Finding the right words to describe what I was feeling was a challenge, even for myself. “I think that is just how it goes for me after a tough loss. Losing is not new to me, but it is also an opportunity for me to take a step back and try to pick up the pieces,” he bared. Aside from finding the right words to express himself, Folayang also took an extended break to understand the errors that he made during the lightweight championship contest. “I needed the time off to realize where I went wrong – whether that was in my preparations or in the fight itself. I wanted to know where I had miscalculated. I reviewed every angle, and I really took the time to look at my mistakes,” he disclosed. Folayang stressed that he needed to relax and ease his mind before he could even think about returning to Team Lakay and resume training for another bout. “I am a firm believer that this game is mental, first and foremost. After you get your mind right, then you can start to work on the physical aspect of it all. It does not matter how strong you are; if you are not in the right frame of mind, you cannot move forward,” he asserted. The heartbreaking knockout setback could have swallowed Folayang whole, but it only ignited the fire within him to continue his illustrious professional career. 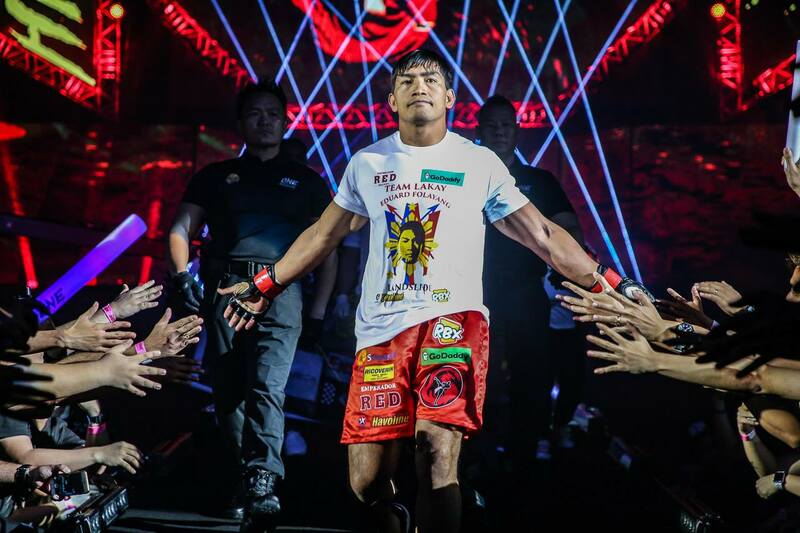 Using his defeat to Nguyen as a defining moment to learn, Folayang was able to ace his comeback bout with flying colors, defeating previously-unbeaten Russian stalwart Kharun Atlangeriev by way of unanimous decision this past May. As he regains his position as one of the top lightweight contenders in ONE Championship, Folayang could not avoid returning to the place where he experienced his painful loss. Folayang is penciled to square off with Russian newcomer Aziz Pahrudinov on the undercard of ONE: REIGN OF KINGS, which takes place at the 20,000-capacity SM Mall of Asia Arena in Manila, Philippines on July 27. The 34-year-old Baguio City native seeks to erase his painful memory at the aforementioned state-of-the-art showground by having his hand raised against Pahrudinov. “The last time that I was in Manila, I let everyone down with my performance. It has haunted me ever since. Come this fight, I am coming back for redemption. I am going to war and win it,” Folayang said. The man standing Folayang’s way is Pahrudinov, who holds over eight years of prizefighting experience under his belt and owns an immaculate mixed martial arts record. Pahrudinov is even considered as one of the toughest Russian lightweights in the sport as he has constantly punished his opponents and grinded out 20 impressive victories, with 13 coming by way of submission and six by knockout. Folayang seems to respect Pahrudinov’s experience and accomplishments, but he is confident that he will give his opponent some problems in the striking department. “This is going to be a good, exciting fight, and I am excited. I will do my best to keep every advantage and win. He does not have many weaknesses, but I would like to test his striking. Let’s see if he can keep up with me on the feet,” he stated. According to Folayang, his familiarity with Russian mixed martial artists will play a pivotal factor in the three-round lightweight encounter with Pahrudinov. “He is another tough Russian opponent, with the typical Russian style – aggressive and calculated. He has great wrestling and solid striking, and excellent all-around skills,” he explained. “It is hard to face these kinds of fighters because you have to be on your toes the entire bout. Get too close, and there is the threat of the takedown. I will be prepared to face this style once again,” Folayang added. Folayang believes that a convincing triumph over Pahrudinov will keep him relevant in the stacked 77.1-kilogram weight class of the promotion. “Lightweight is one of the deepest divisions in the organization, and there are so many great guys all wanting to get to the top. I have to keep winning so I can stay in the mix,” he ended.